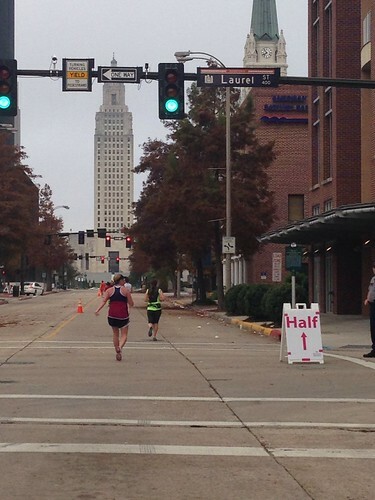 Let me preface this by saying the only training I did for this race was the half-marathon I did in October. Seriously, the only running I’ve done since then was a few laps around a tennis court during boot camp. And even that was before Thanksgiving. So in light of that, I’d say I did pretty darn good! Got up, made a protein shake/energy drink combo (I’ve been doing an Advocare challenge for the past few weeks) and ate a bagel (mmm, carbs) and drove my mom’s car to the start. It took me longer than I’d hoped to get out of the house because my mom’s car is one of those fancy push-button ones and I couldn’t figure out how to turn it on. Yeesh. And then when I got downtown, I couldn’t find the key fob, and it was just v stressful. But I survived. Got to the start. I’ll spare you the details of the start. 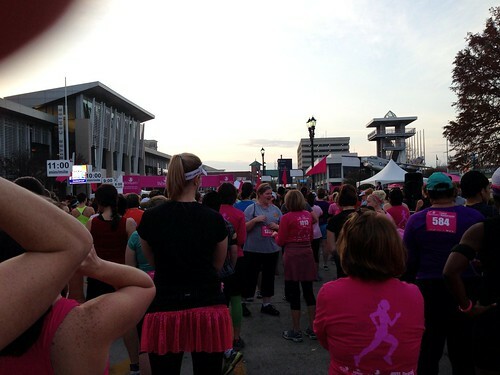 At least I made it through the port-a-potty line before the race started, unlike at the Jazz Half. So, okay, the race starts. I had my interval timer set to a 2 minute run: 1 minute walk cycle, and I felt pretty good. One of the great things about this race is that it was small (about 425 runners) and so I didn’t have to weave in and out of people. But it was unseasonably warm. I was very worried about this. Fortunately, the sun never really came out, and that helped tremendously. I was having a good time. People always love my shirt, and I get lots of fun compliments on it. And since I was running for a family friend who is getting treated for leukemia, I had a sign on my back saying I was running for Laine Z. And a woman passed me and said she went to high school with her! (Or maybe it was her sister, I can’t remember now.) Anyway, it was neat to meet a mutual friend in such a small crowd. 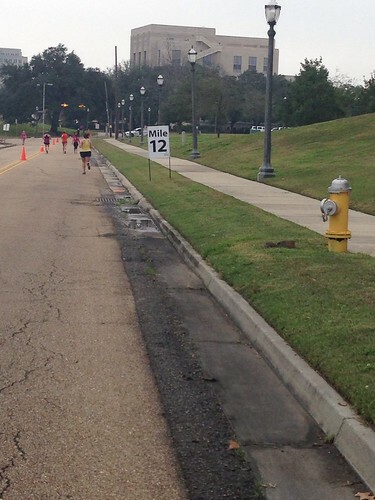 At around mile 3, you could decide whether you wanted to do a 10K or a half marathon. I was kind of worried that I would see the 10K turnoff and not be able to resist it. But frankly, I wasn’t even tempted. Whew. 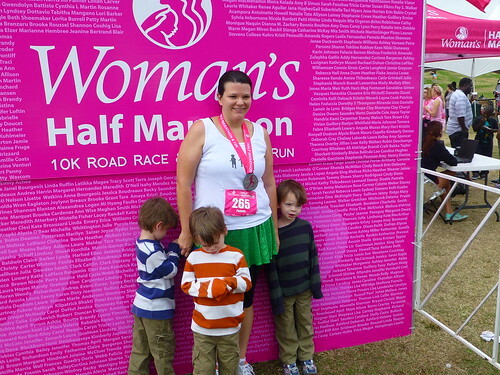 And this was my tenth half-marathon, so I wanted to hit that milestone. So from then on, I ran and ran and ran. And walked, I mean. Ran and walked. 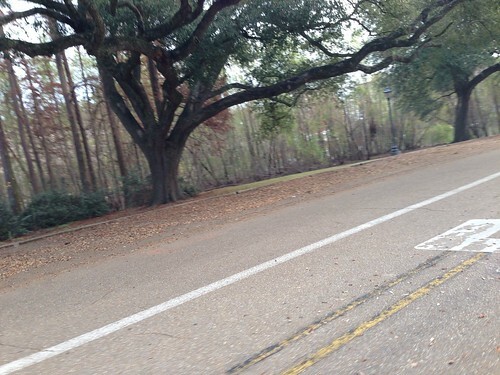 We went through the LSU campus (where I spent, ahem, six years – and no, I didn’t go to grad school) and around the lakes. It was a really beautiful course. And there were TONS of water stations. I really appreciated this. I don’t expect more than one station every couple of miles, but I would guess there were at least a dozen stops throughout the race. I didn’t even have to stop at all of them, because they were so plentiful. The support was fantastic. My freshman dorm was on the other side of those trees. Memories! At about mile 7, I started to feel the heat. And probably the consequences of going out too fast in the beginning. 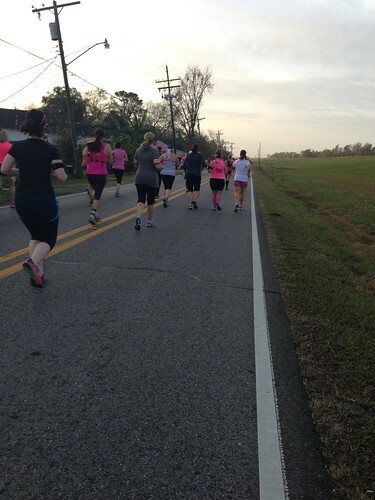 And the hills (you laugh, but New Orleans is SO flat that it makes Baton Rouge look positively mountainous.) So I decided to set my timer to about 1:30 run to 1:00 walk. And I continued for a while at this pace. Until I decided, to hell with the timer and turned it off. And just ran when I felt like it (mostly on “downhills”) and walked when I felt like it. I just wanted to finish in under three hours. I knew I wasn’t going to do better than the Jazz Half (2:33), but I was totally fine with that. And so on I went. I was taking pictures with my iPhone, posting to Facebook, texting my mom to see if they were at the finish line yet, and just having fun. No pressure. 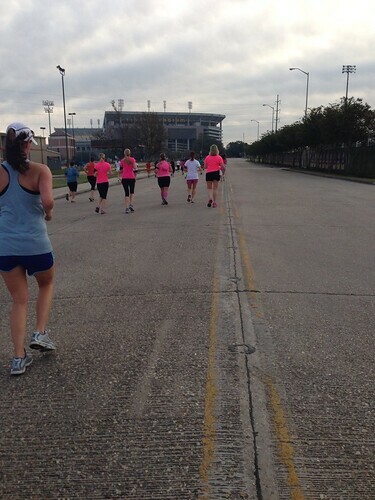 We ran around the state capital, through some pretty parks and then back to downtown. Was SO happy to see this! 1.1 to go! Done! And in 2:44:59, my second/third best time! See, after all that walking, I still finished fifteen minutes faster than the one I did in March! Not too shabby. Afterwards, I got my picture taken, got some snacks for me and the boys, and ran into a few old friends. I was also able to get my results immediately, including my splits from all the chip mats. Very nice! All in all, a very good race. Well-organized, great course, fantastic support. I’ll be doing it again next year! Hey that’s me in the second picture!!!! Chip races are the best. No stress about, ‘did I start my watch at the right time? Did I remember to look at my first mile marker? did I stop the watch the right time?” Man, I miss running.